Making setting up and tearing down your deer blind so easy, that one man can do it! GRANBURY, Texas - July 14, 2017 - PRLog -- The Swift Lift introduces their mobile deer blind onto the marketplace from their location in Granbury, Texas! This product enables hunters to attach the trailer to their vehicle and drive out to their favorite hunting spot and be setup in minutes. If the lease is lost, or a new location is better, you can be packed up and ready to move in minutes as well. 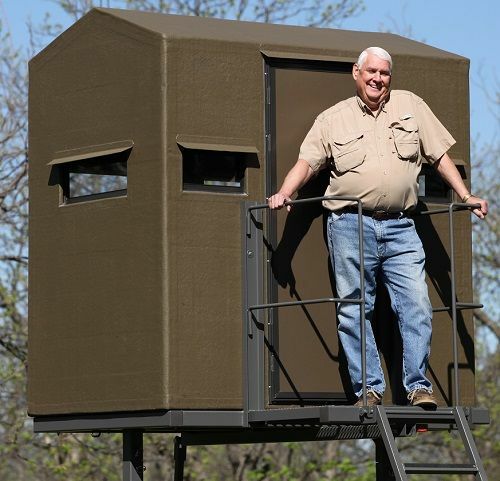 Typically, it takes a hunter and his buddies a few hours to setup a deer blind tower, and it's a real hassle to tear it back down if you need to move it. After doing this for many years, Mel Robinson, the founder of this company decided to engineer something different. When you see the quality and ease of the Swift Lift, you'll want one for this coming hunting season! This lift can serve many purposes versus just for hunting. Anything that requires you to be 8 to 10 feet in the air to open the view, will be able to make great use of this product. If you're an avid hunter, this is something that you're going to want!